New to “window and door talk”? Below are diagrams of popular window and door styles with different parts highlighted. Other types of windows and doors might have slightly different components. Head – The main horizontal member which forms the top of the window frame. Grids – Exterior and interior grid options are available with some windows to better simulate real divided lites. Hardware – Window locks and operating handles. Weather-stripping – Weather-stripping is essential to ensure efficient, weather tight seals for your windows. Insulated Glass – A combination of two or more panes of glass with a hermetically sealed air space between them. Upper Sash – A single assembly of stiles (sides) and rails (top and bottom) made into a frame for holding insulated glass. The top sash is known as the Upper sash. 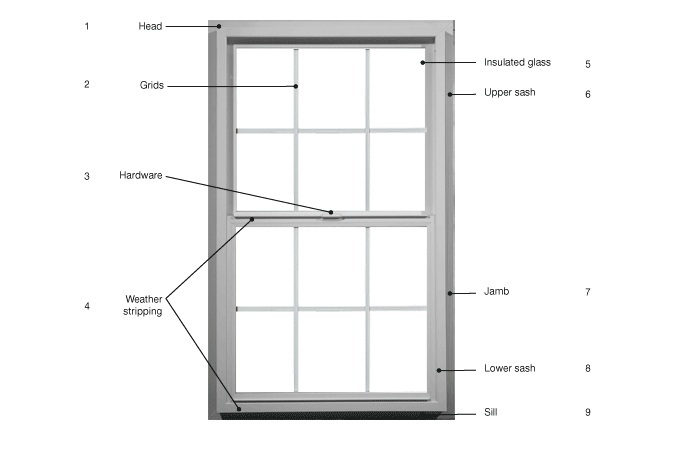 Jamb – The window frame sections forming the top, sides and bottom of a window frame. Lower Sash – A single assembly of stiles (sides) and rails (top and bottom) made into a frame for holding insulated glass. The bottom sash is known as the Lower sash. Sill – The horizontal section (ledge) forming the bottom of the window frame. Head – The main horizontal member which forms the top of the sliding door frame. Sill – The main horizontal member forming the bottom of the sliding door frame. Operable panel – the door panel that opens and closes. Hardware– Door locks and operating handles. Talk to your dealer or contractor about stainless-steel hardware that meets or exceeds the forced-entry codes in your area. Jamb –The patio door frame members forming the top, sides and bottom of a sliding door frame. Handle-Activated Locking System – Many patio doors use a handle-activated lock system. A multi-point lock system provides extra security, fastens your door securely in place and prevents warping brought on by the elements. Lock Stile– The patio door vertical structural member which closes against the jamb of the surrounding frame; on the opposite side from the hinges. Weather Stripping– Weather-stripping is essential to ensure efficient, weather tight seals for your door. Sill– The main horizontal member forming the bottom of the patio door frame. Top Rail– The top horizontal structural member of the patio door frame. Hinge– A device that allows the turning or pivoting of a part on a stationary frame. Hinge Stile– The patio door vertical structural member where the door pivots; found on the same side of the hinges. Bottom Rail–The bottom structural member of the patio door frame. Stop by our Door & Window Showrooms in Concord and Berkeley. We will be more than happy to help you selecting the perfect door or window for your home.